Super Simple Gratitude Tree for Thanksgiving! The kids and I have really enjoyed making this super simple gratitude tree this year using Sharpie pens and contact paper! 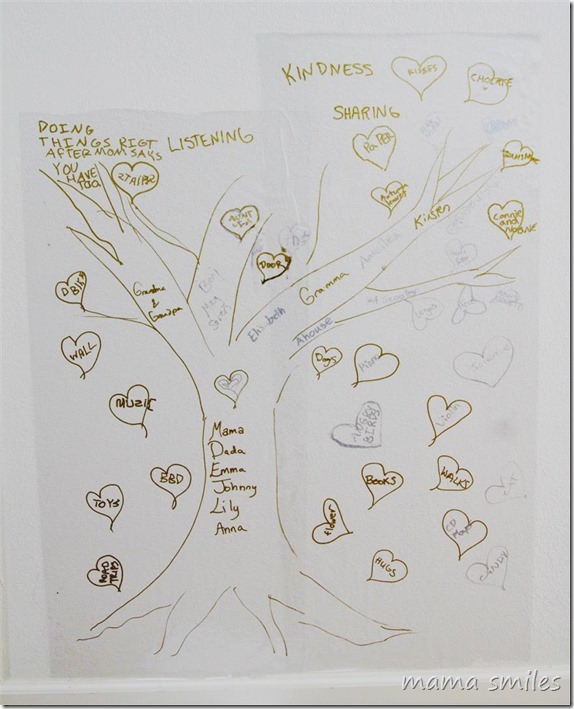 We started off drawing the tree with the contact paper on the floor, and adding our first few heart-shaped leaves with ideas of things we were grateful for inside. Some things (mostly people) got added to the tree trunk and branches. We wrote things we can do that make us happy at the top. We will keep adding new heart-shaped leaves with things we are grateful for throughout the month. I was very excited to see that this activity was very easy for the kids this year! They remembered similar activities from previous years (in the past, we have made gratitude chains and thankful hands as well as the traditional gratitude tree), and they all had plenty of things they wanted to add to our tree – they are adding new leaves every day! I love that it is all flat against the wall, so no leaves falling off (or being pulled off by one-year-old Anna). We used Sharpie paint pens, which are pretty (gold and silver – silver doesn’t show up so well in the photo), but a little hard to write with against a vertical surface. So we will probably do this again next year, but only use normal Sharpie pens (which was actually my original plan, but my colored Sharpies are MIA, so this was a fun substitute). I thought it was very sweet that the kids wrote that they were grateful for “a house”. I was also thrilled to see that they were writing the names of neighbors and classmates on the tree – a sign that they are starting to feel settled here! Their shared imaginary friends – Connie (now spelled phonetically, but still a boy) and Noone (Connie’s friend, who appeared a few months after Connie) also made the list! 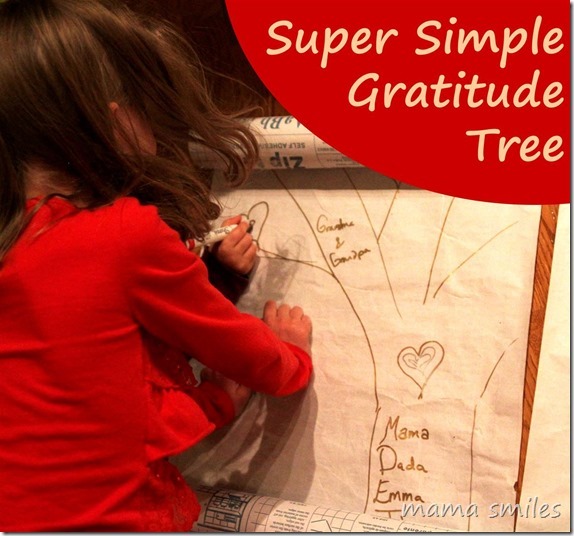 Are you making a gratitude tree this year? 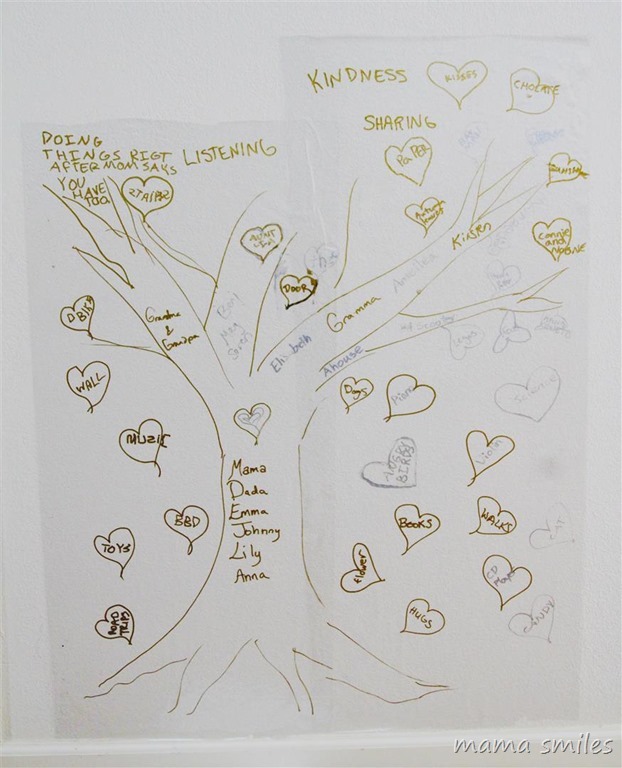 I love the gratitude tree idea! It’s something I feel J will understand and like (his prayers are very thoughtful for a 4 year old). Thanks for the idea. My kids really enjoy this – especially this year! I hope J will as well. I love your gratitude tree! Is it Emma’s handwriting – I am so impressed! We are doing gratitude leaves and hanging them on the string this year, plus I am going to share our “gratitude game” invented by daughter in Friday post. Beautiful, on so many levels. What a wonderful way to practice and expand thankfulness! I’m glad the kids are starting to feel settled, and I hope you unearth your other Sharpies soon! Thanks! I unpacked all the boxes by stashing a few things in places. It was great to get rid of the boxes, but now I need to organize better! What a great activity for a road trip! I was pretty happy when Emma added that to the list! I really love this project and I’m so glad to see that Connie and his friend also made the move safely!! MaryAnne this is a beautiful idea. I absolutely love it! (the headline grabbed me over at Pragmaticmom’s) thank you for sharing. Thank you, Rae! I’m so glad you loved this idea! We are really enjoying our gratitude tree! Thank you so much for featuring my Pinterest account! Beautiful idea! I’ll see if I can try this with my kiddo tonight. I usually ask him what’s his favorite part of the day, but I don’t think I’ve ever asked him what he’s most thankful for. Thanks for the idea! So great to do this with your kids! I’m not sure what we’re going to do this year. I’ve been traveling for a week now so I need to figure it out when I get back! You’ve been busy! This idea was nice and simple, which was exactly what I needed this year. We haven’t got our gratitude tree up yet…I’m not getting much of the stuff done that I like to do..but we have talked a lot of gratitude this year! I am excited to get a tree made…and get our thoughts up on the wall! Great activity! It will be part of my round up on Monday. Thank you for featuring me, Kim!